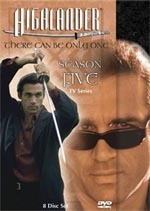 A lot of fans have complained that the formula for the Highlander television series is awfully repetitive - Duncan MacLeod (Adrian Paul) faces off against a fellow Immortal at the end of virtually every episode – though this being the first time I’ve actually seen the show, it came as something of a surprise to discover that the series is actually fairly engaging. And though season five would eventually turn out to be the penultimate season of the program, it seems as though there’s enough here to satisfy both the casual viewer and the die-hard fan (again, I say “seems” only because I’ve had no experience with Highlander – aside from the films – prior to this point). If you’ve ever seen one of the Highlander movies, you’ve already got a pretty good idea of what the show is all about. Immortals have been given the gift of (not surprisingly) immortality, and can only be killed via decapitation. As you might expect from the signature line of the franchise (“there can be only one”), Immortals become even more powerful once they’ve killed a fellow Immortal. As such, Duncan spends a lot of time caught up in battles – though there are other elements present in the series. In terms of the acting, Paul makes for a fine and charismatic hero. Then again, he’s following in the footsteps of the notoriously unappealing Christopher Lambert, so that’s probably not saying much. Oddly, the series occasionally tries to emulate Hercules’ comedic vibe, something that just doesn’t work at all (this is particularly evident in the episode that finds Duncan the inspiration for the latest work by a romance novelist, played by Sandra Bernhard). It’s obvious that the show works best when it adopts a more serious tone, exploring Duncan’s past and his struggle to come to terms with his existence. This eight-disc set collects all 18 episodes from the series’ fifth season, as well as alternate cuts of two of the episodes (“Comes a Horseman” and “Revelation 6:8”). The collection also includes a whole host of extras, which should certainly please fans of the series. Audio: Highlader Season Five is presented with both Dolby Digital and 5.1 soundtracks, and they’re both quite effective. In some of the more active sequences – ie whenever Duncan steals power from another Immortal – the soundtrack becomes especially impressive, and it’s easy enough to forget that this is a television show – not a movie. Video: With only three episodes per disc, it doesn’t come as much of a surprise that these transfers are exceptionally crisp and clean. Aside from watching the series in HD, there’s no doubt that the show has never looked this good. Extras: Here’s where this set really excels. Following in the example of the Hercules DVD set, each episode includes some kind of bonus feature – whether it be a commentary track or interviews with the cast and crew, while all contain a good amount of bonus footage (this is not to mention the Watcher Chronicles, which essentially purport to provide info from the point of view of a Watcher). Additionally, there is also an option for video commentary – though these are just truncated versions of the audio commentaries. The first disc includes a stills gallery, while disc seven (which contains those alternate cuts) comes with a blooper reel along with two featurettes (one on the duels in the show, and another on Duncan’s various romances). Finally, there is a CD-ROM included, which contains scripts and other assorted production material.